The bloggers of the Virtual Book Club are celebrating the works of Jan Brett this month and my class enjoyed her beautifully illustrated book titled “Gingerbread Friends” then dove right in to make a terrific smelling batch of gingerbread playdough…. The playdough wasn’t quite stiff enough to keep around for very long but the smell of the seasonings was wonderful. Our classroom smelled amazing for a week! Check out the linky below to see all the other Jan Brett books and activities from my fellow bloggers! 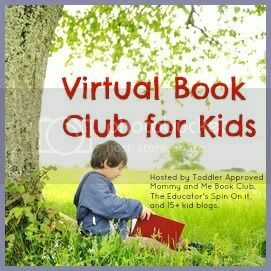 To see more ideas from the other participating Virtual Book Club bloggers just check out the blog hop below! Remember, if you are viewing this post by email or in a RSS Reader, you may need to click on the title of this post to view the blog hop by actually coming to my blog and viewing it at the end of this post. Link up only posts inspired by Jan Brett that share children’s book inspired crafts, activities, recipes, etc. Any other posts will be deleted. this is really cute!! i want to try this with my daughter! What a fun way to bring this book to life. Everyone looks like they’re having a wonderful time.